What’s included: Full list of available services can be seen here. Promotional value expires 120 days after purchase. Amount paid never expires. Additional fee over voucher value must be paid at time of service. Limit 1 per person, may buy 1 additional as gift(s). May be repurchased every 120 days. Must use promotional value in 1 visit(s). Not valid with other offers or promotions. Merchant is solely responsible to purchasers for the care and quality of the advertised goods and services. Mobil 1 Lube Express features warranty-approved oil changes, express tire service, and environmentally-friendly car washes. Mobil 1 team changes a vehicle’s oil, top up the fluids, check all the hoses and belts, and evaluate other vital fluids and components. Three locations serve clients in Langley and Richmond. All of Mobil 1’s work is warranty-approved and appointments are never necessary. 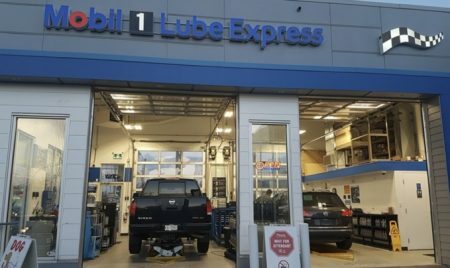 Mobil 1 Lube Express employs experienced, knowledgeable, BCIT, and Certified Journeyman Automotive Technician Trained staff.